Something unimaginable happened on Thursday (Jan 18) in Arakan state of Myanmar (Burma). Dr. Aye Maung, Chairman of Rakhine ultranationalist party ANP (Arakan National Party, was arrested by the Burmese authorities. 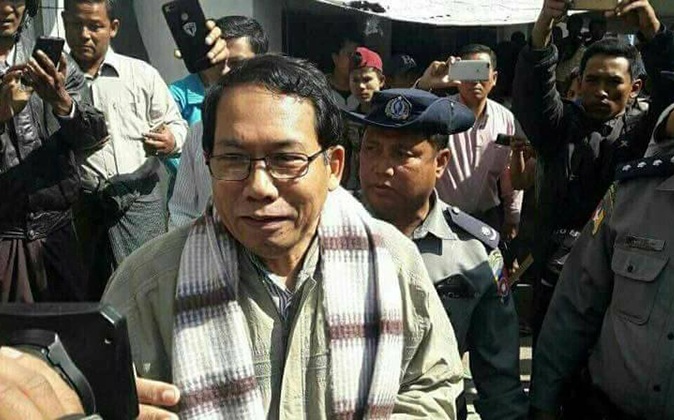 According to a statement released by Myanmar's Ministry of Information on Wednesday night, U Aye Maung was booked with 3 charges: Section 17 (1) of the Illegal Associations Act, Section 505 (b) of the Penal Code causing Public Disorder and Section 122 of the Penal Code committing 'High Treason' against the State. Without any reservation (of words), Dr. Aye Maung is one fascist politician who had cooperated with Burmese military regime by playing a direct role in genocidal violence unfolded against Rohingya in June 2012 onward and continued to be complicit in it up until his arrest on Thursday. So, what has led the Burmese military regime to arrest their once partner-in-genocide? It's no secret that the Burmese regime treats common people/political figures including their own proxies as expendables. When they are no more in use or perceived as threats, they are disposed like disposable items. Thus, Aye Maung could be no exception for the regime. The Burmese military have seen using Dr. Aye Maung as a political proxy more benefitting than the threats posed by his long-time associations with Rakhine rebel groups such as Arakan Army (AA) and Arakan Liberation Party (ALP). But no more! He's now perceived as a significant threat by the Burmese Army Generals to their power and the sovereignty of the nation and hence, leading to his arrest. The humanitarian and political situations in Arakan state have significantly deteriorated since the state-sponsored violence against Rohingya in June, 2012. Especially October 2016 onward, under pretext of a Clearance Operation in response to a few sporadic attacks on Police posts conducted by Arakan Rohingya Salvation Army (known as ARSA, a home-grown but ill-trained Rohingya rebel group mostly armed with sticks and swords), the Burmese military have unfolded a systematic genocidal violence against the Rohingya with active collaborations of Rakhine Buddhist extremists largely followers of Dr. Aye Maung. Since then, we have witnessed the Burmese military, Security Forces and the Rakhine Extremists killing more than 10,000 Rohingya civilians; burning down entire swathes of Rohingya villages in Maungdaw District and Rathedaung Township; and expelling more than half a million of their population into neighboring Bangladesh, triggering one of the biggest humanitarian disasters in human history. On January 16, during the 233rd commemoration ceremony of the Fall of Arakan Kingdom to the Invading Burmese Army, Dr. Aye Maung; U Wai Hun Aung, a Rakhine author and social commentator; and a few others were reported to have said that Burmese treated Rakhies as their Slaves and today's political climate in Arakan state was the perfect time for the Rakhine people to march towards secession of Rakhine state from Myanmar and create a separate independent Rakhine nation. They urged the Rakhine Buddhists in attendance to do civil disobedience to the Burmese government and revolt the Burmese military through joining Arm Struggles, apparently referring Arakan Army (AA). Late Tuesday evening, following Aye Maung's speech in Rathedaung, around 4,000 Rakhine people in Mrauk-U (the State’s Ancient Capital) staged a protest which had been banned by the Government beforehand. The protesters reportedly attacked the police station and robbed Police's guns chanting the slogans of independence. The police responded recklessly by firing into the crowds killing at least 7 protesters and injuring a dozen. Nevertheless, my questions are "where do Rohingya, a people subjected to Genocide, stand amidst this increasingly hostile political climate in Arakan state? Do they have anything to gain or lose? Can they gain anything out of it and get a breathing space for themselves?" Dr. Aye Maung clearly saw a political opportunity in the current fragile political environment in Arakan state which, if properly taken advantage of, is huge enough to create an Independent State. Thus, he dared urge the public to take up arms and resort to rebellion against the Burmese government knowing that it could risk him his career, his life or to a prolonged prison term. So, does any Rohingya especially from among those leading the community see any opportunities to stop the ongoing violence and secure at least basic rights for the Rohingya out of the widening political gap between Rakhine and Burmese? Or will they still look on with their hands folded; and let Burmese military and others take advantage of the situation as usual? Will any of the Rohingya leaders dare take some risks like Dr. Aye Maung just taken? Very soon, the Burmese military may need the Rohingya community to counterbalance the Rakhine separatist leaders and elements in Arakan state. Therefore, they could start approaching Rohingya leading figures at home and abroad to appease their fellow community members on various topics such as Rohingya refugee repatriations and other political rights etc with refreshed strategies. In their renewed strategies for Arakan state, the Burmese military could even try to conduct dialogues with ARSA, who knows? But as usual, their actions will be divisive and insincere to the core. So, will the Rohingya leading figures and activists subject themselves to the Burmese divisive and exploitative politics yet again or be visionary and thoughtful enough to milk something out of the current political climate for their people? Do not subject yourselves to the divisive politics of the Burmese military for some narrow personal interests; or let others decide your future for you. Establish some careful strategies to achieve something out of the current political climate in Myanmar. Remember you have got another historic opportunity to your advantage. Do not let it go in vain. Be thoughtful, smart, cautious, cooperative and proactive!